Yesterday evening I tried to cram two gigs and the US Presidential election into one evening and today my brain feels like mush! My evening kicked off at Rough Trade East where Mumford & Sons were performing a free instore set. I've been intrigued with this band ever since I heard their Black Cab Session recorded at The Green Man festival, well intrigued enough to leave the comfort of my central heating and head out on what was a cold and miserable London evening . I picked up my wrist band an hour early and headed across the street to Cafe 1001, a great place to kill an hour, pick up a snack and of course make full use of their free wi-fi. Following a sound check and a delayed start, Mumford & Sons squeezed themselves onto the tiny stage for a seven song strong set. They seemed a little nervous which surprised me since they have just toured the States (with Johnny Flynn and Laura Marling) and completed a two week tour of the UK. Maybe it was the "instore factor" bringing the audience that little bit closer to the stage and as they acknowledged in between songs "This is our first ever instore, I think, apart from the time we played in the fruit and veg store ages ago..."
and two new songs I didn't catch the name of. For me, Mumford & Sons is all about the singing. They could sit quite happily in the bluegrass/folk section of your local record store gathering dust over time if it weren't for their singer Marcus Mumford’s amazingly unique voice. 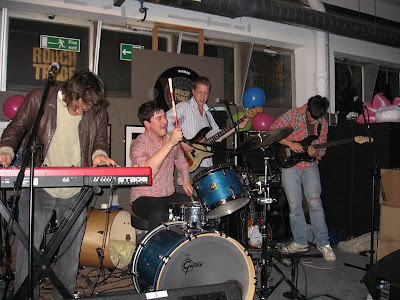 Marcus doesn't always find himself at the front of the band, he also doubles as Laura Marling's drummer. When he pushes his voice it takes on a raw gravely quality that judging by the contorted expression on his face, getting the sound out might actually be physically hurting him! His voice is powerful and interesting and when accompanied by harmonies provided by the other three band members, the results are also striking. Mumford & Sons give me the feeling they might have been hiding away in a barn somewhere deep in the countryside drinking whisky, chopping logs and writing songs all day long. Don't get me wrong, I actually quite like the romantic image this conjures up (I can almost smell the wood fire smoke), but they also manage to blend in a youthful London look (they're all in their early twenties) which I think can only help widen the appeal of their music across the generations. It was a pleasure to hear these guys play last night, maybe a potential future Mercury Music Prize nominee? Not bad for a band that’s only been together since 2007. Here's a video I shot last night called "Sister". Apologies but the audio and picture quality is pretty poor, guess I need better equipment! I found a better quality video from last nights performance on YouTube which I have also posted below. Mumford & Sons - "Little Lion Man"
Mumford & Sons - "Sister"
Mumford & Sons have just released an EP called "Love Your Ground" and their next gig will be at The Hoxton Bar and Kitchen on December 9th. One of the cool things about the Rough Trade Instore gigs is the opportunity you often get to hang around afterwards and chat to the band. 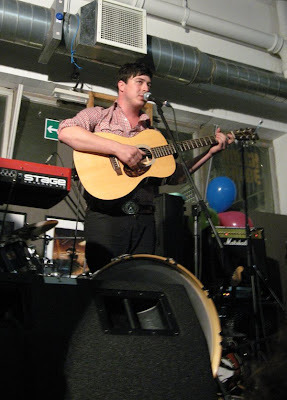 On this occasion I only had time to stick my head around backstage, stick my thumb up at Marcus Mumford to say "that was great" to which he gave me a lovely big smile and then I dashed off into the London night trying to make it on time for the start of the next gig in London Bridge. I’ll write this one up in the next couple of days, as I mentioned, my brain is feeling quite mushy after watching the American election through part of the night. I like Little Lion Man. A video technician friend of mine told me you really need a pro camera to put good quality on YouTube, because of the data compression. Also external microphones give better sound quality, but you need to be an octopus or get a sound technician! Yeah, the sound is always the biggest problem, hopefully the video will at least give people a flavour for the band. i love mumford & sons. i can't wait to hear their recorded material. i have only seen them live opening for laura marling. it turned out i didn't even get to see laura marling play that night cause i had to go to another show, but i really enjoyed mumford & sons' performance. i think these guys are gonna be big pretty soon. i hope so anyways. my personal feeling is that the lead singer is dating marling. but i have no evidence to back that up with.